გრანდ სენტრალ ტერმინალი (ინგლ. Grand Central Terminal, უკეთ ცნობილი, როგორც Grand Central Station) — რკინიგზის სადგურია ვანდერბილტის ავენიუზე (42-ე ქუჩისა და პარკ ავენიუს გადაკვეთა) მიდთაუნ მანჰეტენზე, ნიუ-იორკში. ნიუ-იორკის ცენტრალური რკინიგზის მიერ აგებული ამერიკის შორ დისტანციაზე სარკინიგზო მგზავრობის ბუმის პერიოდში, გრანდ სენტრალი უდიდესი რკინიგზის სადგურია მსოფლიოში პლატფორმების რაოდენობის მიხედვით: 44, და 67 ხაზით ის ემსახურება მგზავრებს მეტრო-ნორზის რკინიგზიდან ნიუ-იორკის შტატის ვესტჩესტერის პატნემისა და დაჩის ქაუნთიში, ასევე ფეარფილდისა და ნიუ-ჰეივენის ქაუნთიში, კონექტიკუტში. Federal Writers' Project (1982). The WPA Guide to New York City: The Federal Writers' Project Guide to 1930s New York. New York: Pantheon Books. ISBN 0-394-52792-5. Fried, Frederick; Gillon, Edmund Vincent Jr. (1976). New York Civic Sculpture: A Pictorial Guide. New York: Dover Publications. ISBN 0-486-23258-1. Middleton, William D. (1999). 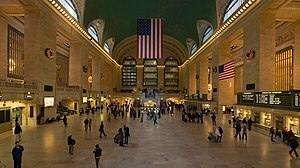 Grand Central, the World's Greatest Railway Terminal. San Marino: Golden West Books. OCLC 49014602. O'Hara, Frank; Allen, Donald (1995). The Collected Poems of Frank O'Hara. Berkeley: University of California Press, გვ. 168. ISBN 0-520-20166-3. Reed, Henry Hope; Gillon, Edmund Vincent Jr. (1988). Beaux-Arts Architecture in New York: A Photographic Guide. New York: Dover Publications. ISBN 0-486-25698-7. National Geographic video - "Inside Grand Central"
ეს გვერდი ბოლოს დარედაქტირდა: 14:13, 3 ივნისი 2015.